The first days of February will be the peak of brightness for the new supernova, named SN 2014J. At 11th magnitude, a telescope will be required to capture the light from the explosion as it brightens a point near the end of the magnitude-8.4 cigar-shaped galaxy. The supernova is expected to peak around magnitude 10.5 on February 2. 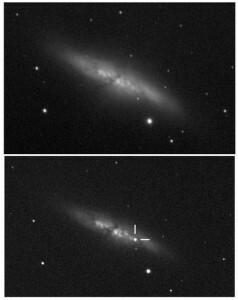 As the hitherto undetected white dwarf underwent a type Ia Supernova explosion, it slowly brightened until it became visible to observers around January 21, 2014, when a group of students at the University of London Observatory first spotted it. Its home galaxy, M82, lies 12 million light-years away, which means we are just now seeing an event that occurred in the galaxy 12 million years ago. M81 and M82 are circumpolar objects and never set for Northern Hemisphere observers. M82 shines at magnitude 8.4 and is an elongated spiral galaxy that can be seen well with binoculars or small telescopes. M81 is even brighter at magnitude 6.9 and easier to pick up in binoculars at a half degree across. The two galaxies lie approximately a half degree apart in the sky, which means they both could disappear behind your pinky finger held at arm’s length. Johann Elert Bode discovered M81 in 1774 before we understood that those fuzzy patches of light in the sky were entire other galaxies and not accumulations of dust among our own stars. Therefore, M81 was originally called Bode’s Nebula, before it was changed to Bode’s Galaxy. The two galaxies make close passes every 100 million years as they orbit each other, causing outbursts of star formation in both galaxies along with strong x-ray emission in M82. The two galaxies will become one in a few billion years. Interactions between them have created brighter young star clusters than any in our galaxy. The two galaxy’s centers are separated by only 150,000 light-years. M82 is the brightest galaxy in far-infrared light in the sky. This energy comes from dust around a supermassive black hole at the galaxy’s core. M81’s rotation curve drops off as you head outward, contrary to our galaxy and many others whose rotation curve increases as you leave the center, which is what clued scientists in on the existence of dark matter in the first place. But M81 acts as one would expect a galaxy to act given only the amount of mass that is visible. Therefore, not much dark matter is believed to exist in M81. wow! alhamdulillah.. what a great website!